Currently, there is a need for qualitative research about how insulin pump therapy changes quality of life, which is significant to people with type 1 diabetes. 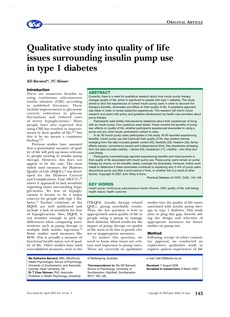 This study aimed to elicit thd experiences of current insulin pump users in order to discover the therapy's benefits, downsides and effect on their quality of life. A qualitative approach was taken in order to reveal subjective experiences. This research will inform future research and assist with policy and guideline development by health care providers about pump therapy. Participants were briefly interviewed by telephone about their experiences of living with an insulin pump. Four questions were asked. These covered the benefits of pump use, effects on quality of life, whether participants experienced downsides to using a pump and any other issues participants wished to raise. In all, 80 insulin pump users participated in the, study. All 80 reported experiencing benefits; insulin pump use had improved their quality of life. Key positive themes emerging from the data included greater control (45), flexibility (33), freedom (28), family effects (seven), convenience (seven) and independence (five). Key drawbacks emerging from the data included visibility - device (25), breakdown (17), visibility - skin (five) and cost (three). Participants overwhelmingly reported experiencing benefits and improvements in their quality of life associated with insulin pump use. These pump users remain on pump therapy by choice, so the benefits clearly outweigh the downsides. However, further work needs to determine if these downsides contribute to explaining why 2-4% of pump users discontinue pump use after a short period of time, or whether this is a result of other factors. Copyright © 2007 John Wiley & Sons.